I haven't been accepting many books for review of late for a myriad of reasons, one main one being that I don't necessarily feel like there is much discretion on the part of publishers as to what they publish. It is feeling more and more that anything can and will be published just 'cause. It seems to me that there are an awful lot of poorly written or just plain "meh" books published that probably shouldn't have been. It doesn't feel as if very skill is required of authors or readers these days! I can't prove these things beyond a shadow of a doubt, of course, but I feel them. Therefore I've made a personal decision to heavily scale back on accepting books for review. My reading time is as valuable as any one's and I want to spend time with good books that will prove a great benefit to myself and my family. Honestly, there are only three Christian book publishers that I trust to produce quality Christian non-fiction anymore. One of those is Shepherd Press. When I saw the title The Home Team pop up, I was instantly curious and wanted to give it a read. Shepherd Press offered to send me a copy for review purposes and I was delighted to dive into this one. I was very happy to have given it some time and attention. In our family, we talk a lot about being a team and that's the first reason this particular title caught my eye. We talk about how we all have to work together to accomplish things and to enjoy life. When any one of us are fighting with another, we stop and remind ourselves that we were placed together for a reason and a purpose and so we need to keep on working hard to stick together. Don't get me wrong - it is hard work! But it is good work and it offers great rewards. We like our team and are always interested in learning how to make it a better and stronger one. Author Clint Archer definitely likes sports and so there are a great many sport-like analogies and stories told to communicate his key points. If you are not a "sports person" don't fret; I am not a sports fan and I had no troubles whatsoever with his stories. I never felt like he was "going off" about a game but skillfully used games and certain athlete's performances to teach how each family member ought to act to benefit the whole unit. His sports analogies/stories were short, to the point, and directly applied to the information that he was trying to pass along. Absolutely do not let the idea that this is a book about sports turn you off. By the later half of the book, he rarely mentions sports at all! 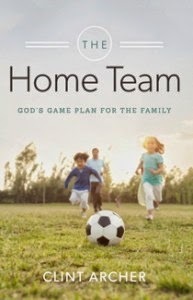 The Home Team : God's Game Plan for the Family is meant to be used as a tool to reformat the family, if you will, into a unit instead of a diverse group of people who just happen to live in the same household for a time. One thing in particular that I found interesting was Archer's admissions that this is a subject he has been and is still growing in. He is quick to say that he is not an expert on family, that he struggles sometimes in his role of providing spiritual headship, and that he still has much to learn. His humble admissions keep the reader asking questions of themselves because if you know the author doesn't necessarily have it all together then it's easier to dialogue and question your own motives and methods as you proceed in building your own family. In other words, he isn't giving you a How To. He merely intends to lead the family to the Bible to learn what it is that God said the family was supposed to be. Then, by God's grace and gift of wisdom, you need to make personal decisions for your own family which possess the ultimate goal of following God and bringing glory to His name. There is no checklist because we aren't cookie cutter humans. Our families cannot look the same. However, if we are doing it right we are all doing it with the same goal in mind. I see no reason to avoid a similar end. even if the particulars in how we get there look a bit different. Ultimately, the purpose of Archer's book is to remind us all of our families' goals and purpose in life. That is? To bring glory to the Lord. If we operate by God's "play book" then we will find life more easily enjoyable but not completely devoid of trials either. Focusing our eyes on the Lord and seeking His wisdom is certainly in our best interest and the end result is something to look forward to instead of dread. I'll let Archer end my post by sharing a quote that I found particularly meaningful as it reminded me that while our families may look different , we each need to keep our eyes on the ultimate prize of knowing Jesus Christ as Lord and Savior. The details all don't matter all of the time but certain details do. (Did you track with that?) Going back to scripture and the Creator of Family is the only way to make things in our individual households work properly. If that is all this book manages to help you remember, then it is a worthy read. This one will remain on my book shelf for a re-read. Many thanks to Shepherd Publishing for sending this book my direction in order to facilitate this review. I received no additional compensation and all opinions are 100% my own. It does sound good. I like that it isn't checklist- or cookie cutter-oriented. Sounds interesting. I tend to shy away from books along these lines but am encouraged that this one doesn't come across as a check list of to-dos for family unity. So, I am intrigued.